Scores Killed By Truck Bomb In Somalia : The Two-Way A spokesman for the Islamist militant group al-Shabab has claimed responsibility. 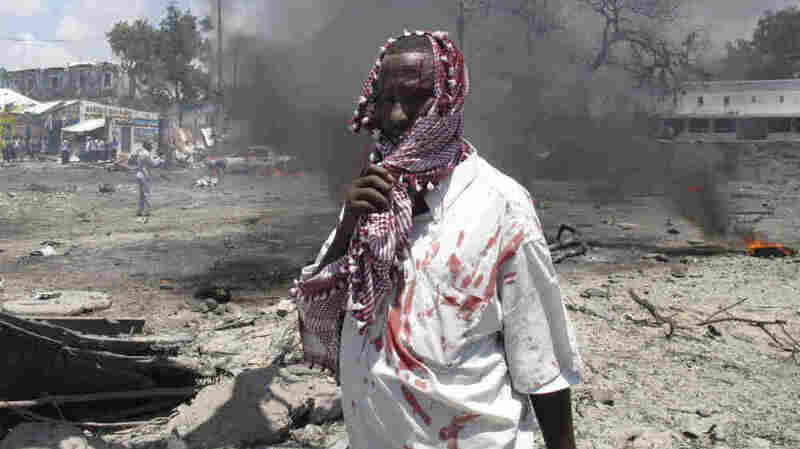 There's been a deadly bombing today in the capital of Somalia. "Islamist militants detonated a truck bomb Tuesday in front of the Ministry of Education in Mogadishu, killing at least 70 people, wounding dozens and shattering a relative calm that had prevailed ... for weeks," The Associated Press reports. "Eyewitnesses said a truck carrying explosives was driven into a gate near a government ministry and detonated. A spokesman for the Islamist militant group al-Shabab told the BBC it had carried out the attack. It is the largest attack since al-Shabab withdrew its forces from Mogadishu in August." The New York Times says that "witnesses reported horrific scenes with dozens of bodies strewn across the streets, including those of students who were registering for scholarships to study in Turkey which has become a major aid donor to Somalia in recent months." As NPR's Ofeibea Quist-Arcton has reported, the al-Qaida linked al-Shabab has not only been battling Somalia's transitional government, it has also been responsible for blocking aid aimed at helping the drought- and famine-ravaged nation.